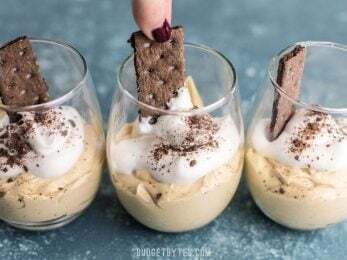 I apologize ahead of time for showing the easiest and probably the most decadent dessert ever. 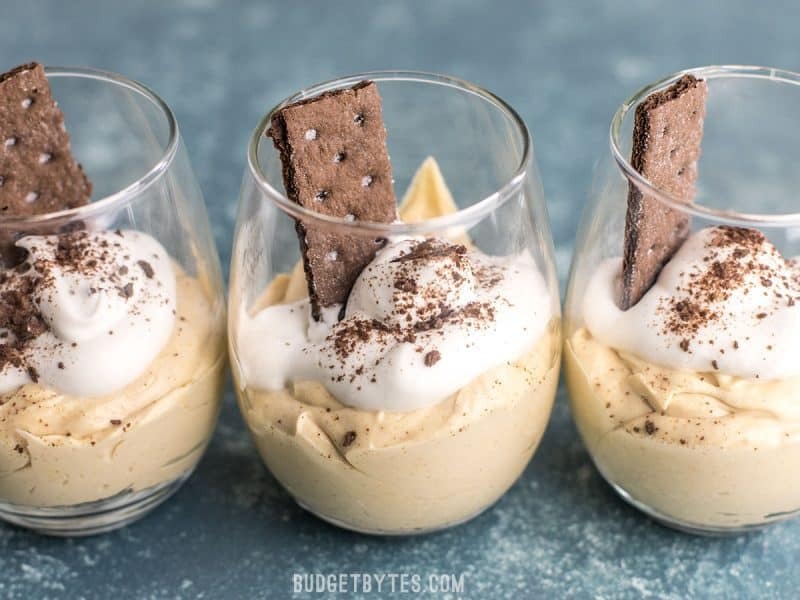 These Peanut Butter Fluff Cups are a smaller batch version of the popular no-bake peanut butter pies. It’s basically like a peanut butter flavored no-bake cheesecake, with a little whipped cream on top and crushed chocolate grahams in place of an actual crust. Basically, it’s DANGEROUS. You could probably scale this recipe down even further to make just two servings, provided you have bowls small enough that allow you to whip the ingredients together (if they’re too shallow in a larger bowl you won’t be able to whip them together). BUT, these guys hold up really well in the fridge, so might as well make four, right? Right. 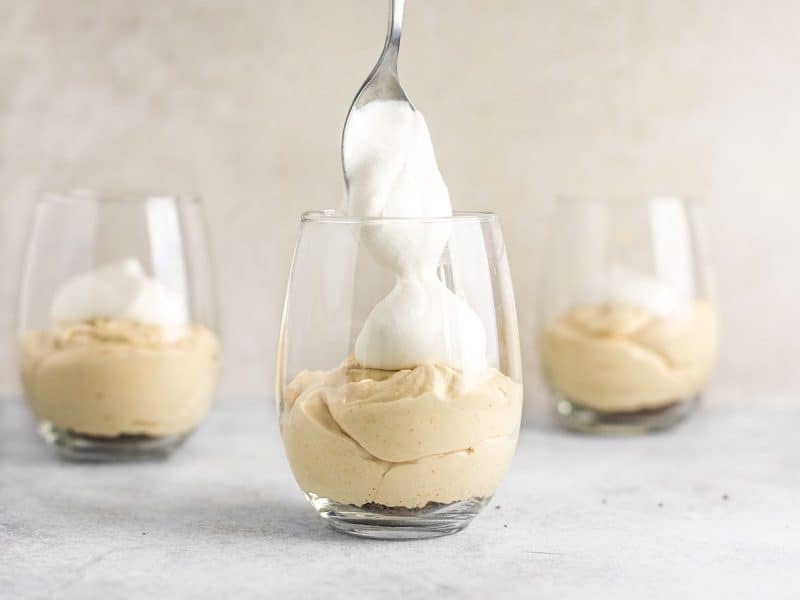 Make the vanilla whipped cream first by placing the heavy whipping cream, granulated sugar, and vanilla extract in a bowl. Use a whisk or a mixer to beat the cream until it forms soft peaks (when you lift the whisk it form a peak that droops over to the side). Set the whipped cream aside. In a separate bowl, whip together the peanut butter, cream cheese, powdered sugar, and milk until it is light and creamy. A hand mixer or bench mixer is suggested for this, since the mixture will be quite thick. Start on low power to prevent the powdered sugar from spraying, and increase to medium once the powder sugar has incorporated. 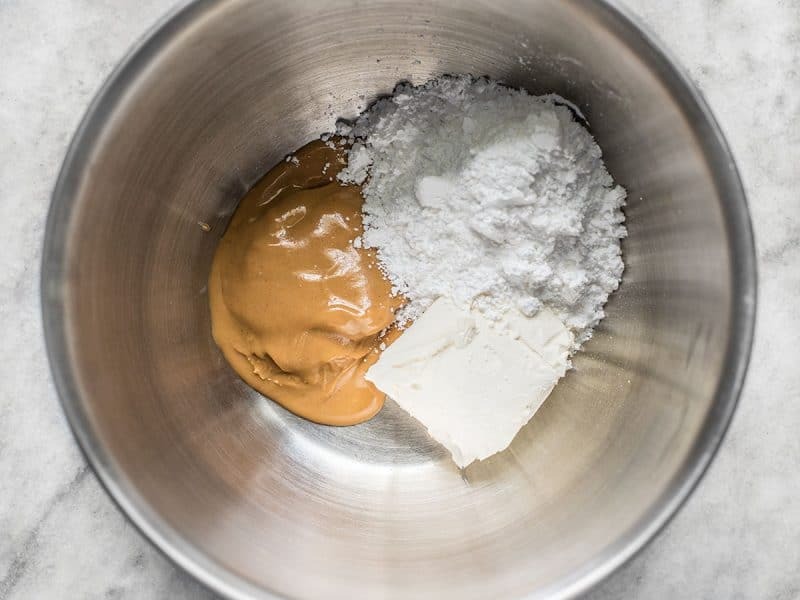 Add 1/3 of the whipped cream to the peanut butter mixture and gently fold them together. Once incorporated, gently fold in about 1/3 more of the whipped cream, leaving the last 1/3 to top the cups. 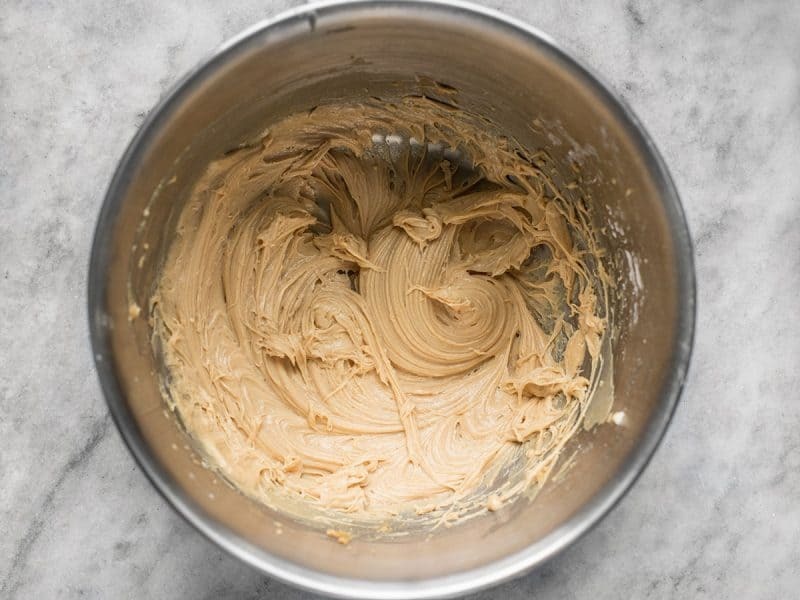 Fold the whipped cream and peanut butter mixture together until smooth and fluffy. 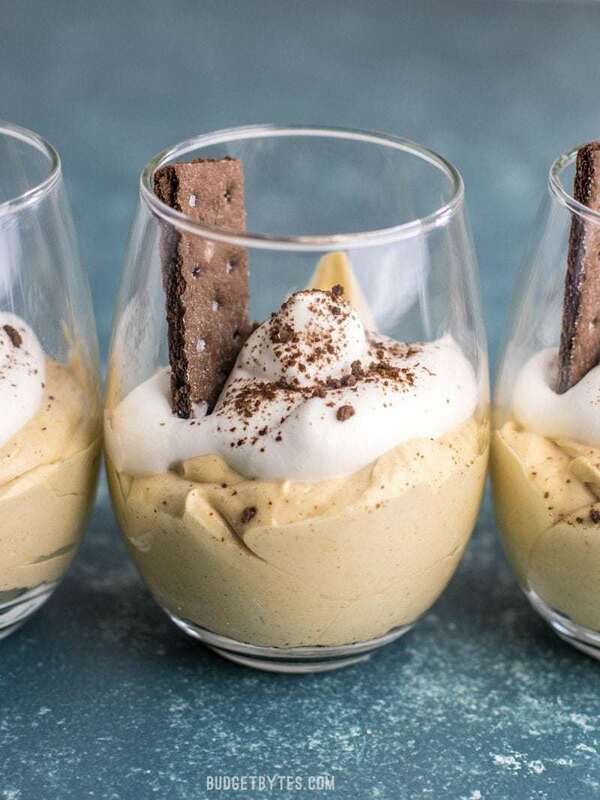 You can serve the cups immediately, or refrigerate until chilled, which will give you a more solid, cheesecake-like texture (they’re more like mousse when freshly made). If preferred, you can use an 8oz. tub of pre-made whipped cream instead of making your own. Start by making the vanilla whipped cream. Homemade whipped cream couldn’t be any easier, especially if you are using a mixer (doing it by hand does take a little elbow grease, but that’s how I always do it!). Place 1 cup heavy whipping cream in a bowl along with 2 Tbsp granulated sugar and 1 tsp vanilla extract. Whip or beat with a mixer until soft peaks form. 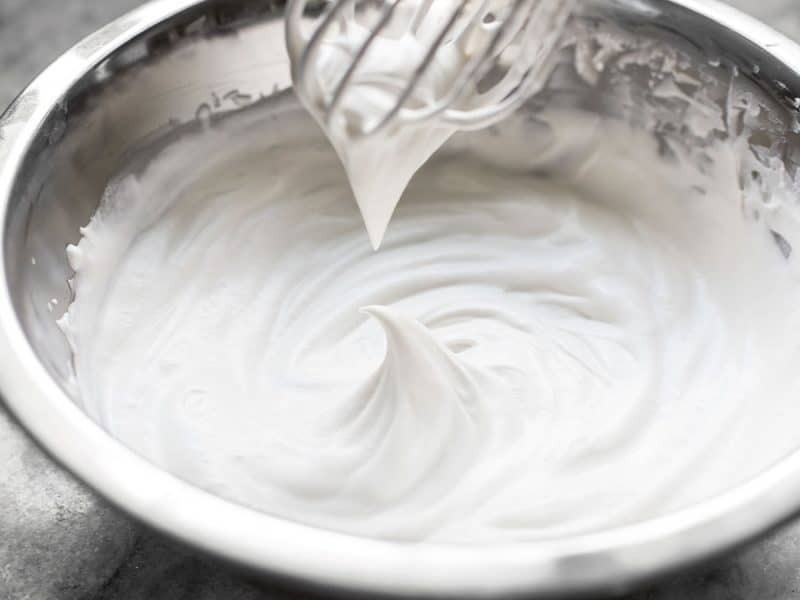 Soft peaks are when you lift the whisk out of the whipped cream it creates a peak that gently slumps over to the side, like in the photo above. Set the whipped cream aside. Next, add 1/2 cup peanut butter (creamy), 4 oz. cream cheese, 3/4 cup powdered sugar, and 1/4 cup milk (not pictured) to a separate bowl. 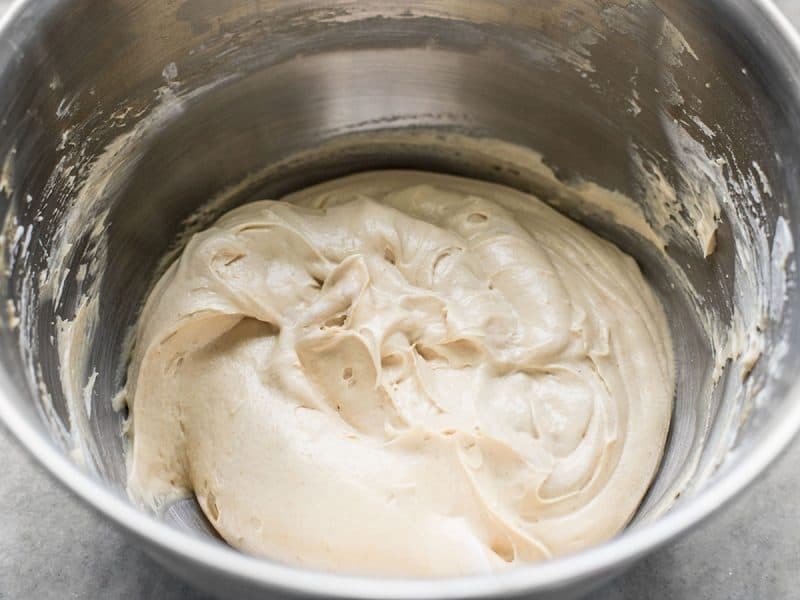 Use a mixer to whip the ingredients together until smooth and creamy. Start with low power to prevent the powdered sugar from spraying into the air, then increase to medium once it has incorporated. First add 1/3 of the whipped cream and gently fold it in until incorporated. Add another 1/3 of the whipped cream and fold in until incorporated again. It’s very important to GENTLY fold and not stir the two together. If you need an example of how to fold as opposed to stir, here is a youtube video demonstrating the technique. At that point it will look like the photo above. You’ll save the rest of the whipped cream to top the cups. 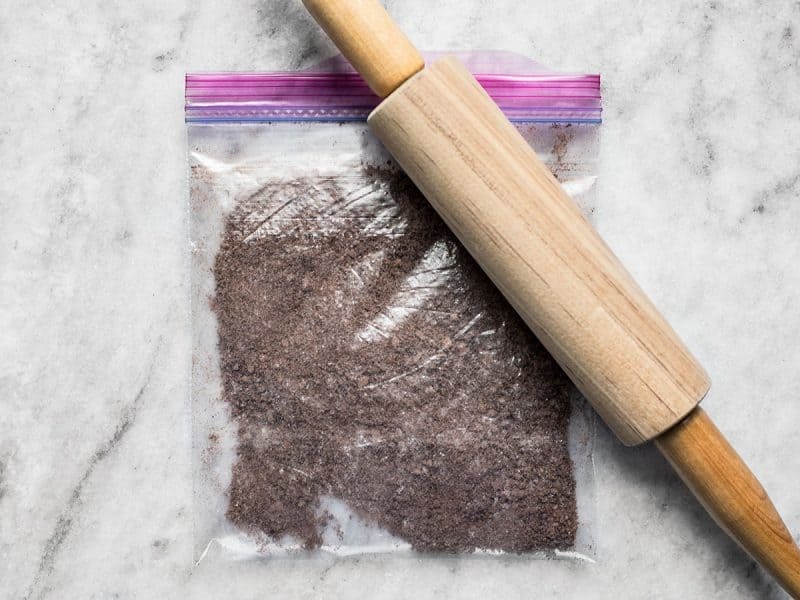 Add 3 of the 4 chocolate graham crackers to a zip top bag and crush them with a rolling pin (or you can use a food processor and pulse until they are crumbs). Divide the crushed graham crackers between four cups or containers (I had four, one is just out of the frame). Save just a little of the crumbs to sprinkle over top when they’re done. 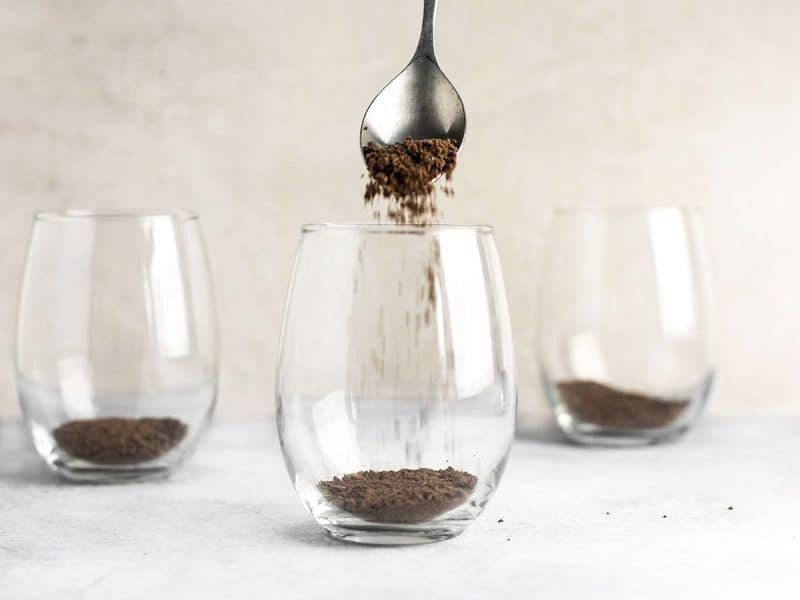 And then to garnish, sprinkle a pinch of the graham cracker crumbs on top of each, then break the last graham cracker into four pieces and stick one piece down into each cup. And that’s it! 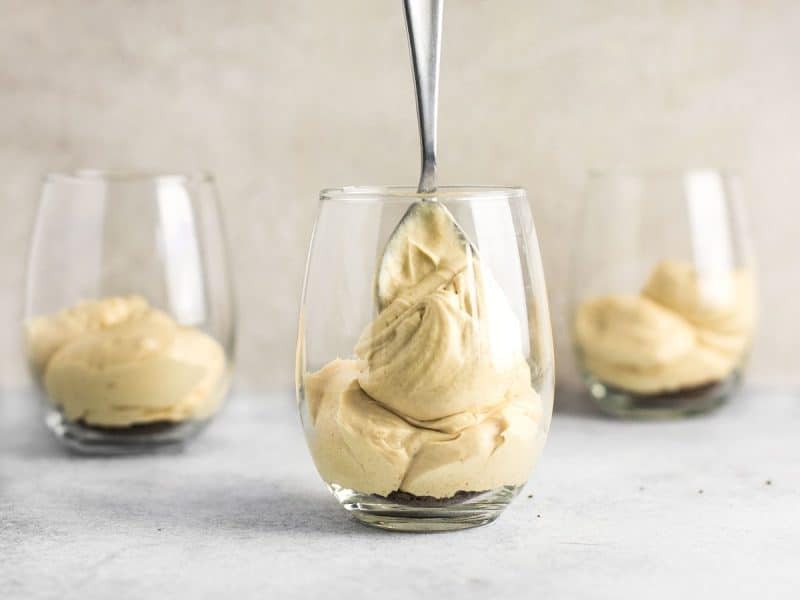 You can eat the Peanut Butter Fluff Cups right away, or refrigerate until later. I had one the next day and I have to say I think I like them refrigerated better! They firm up to a cheesecake-like texture and are just to-die-for. I even like how the graham cracker crumbs get a little moist. ??? ?‍♀️ What’s not to love, though. 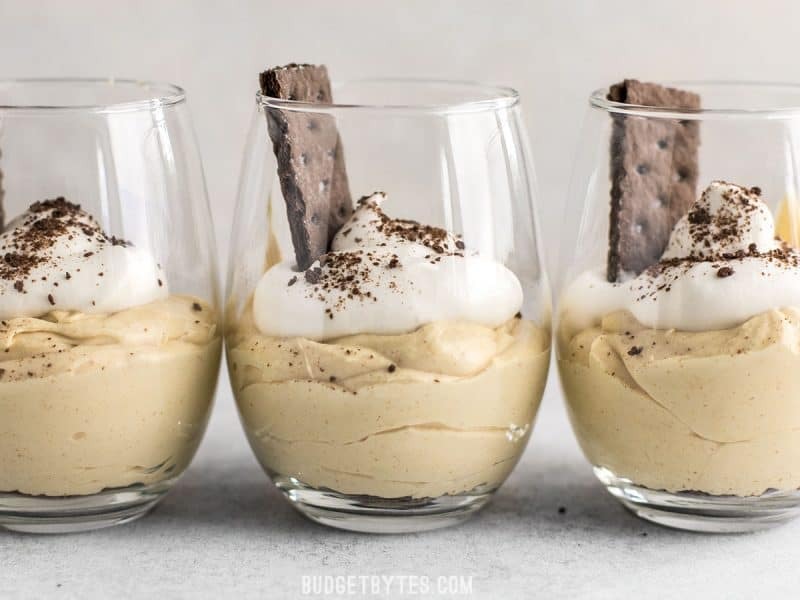 The post Peanut Butter Fluff Cups appeared first on Budget Bytes.